The Milwaukee Public Schools (MPS) Board of School Directors plans to start making adjustments to its 2018-19 budget tonight when the Committee on Strategic Planning and Budget reviews a list of proposals that was released on Tuesday. With the exception of proposed expanded cuts to Central Office, none of the potential changes address the major cost-drivers in MPS’ budget: a massive administration and a generous benefits package. The released amendments provide a first look at what the board is willing to consider. All six proposed amendments would create savings in one part of the budget and reinvest the money back into schools. The current budget proposal includes a 5 percent funding cut across the board to schools, and a 15 percent cut to Central Office. The amendments range in size and scope, from saving $143,034 at the low end to more than $9 million. With the exception of proposed expanded cuts to Central Office, none of the potential changes address the major cost-drivers in MPS’ budget: a massive administration and a generous benefits package. The district’s long-term fiscal battles, including its growing $38 million structural deficit, remain. However, that could still change. Newly appointed interim superintendent Dr. Keith Posley has said that he would unveil his proposed changes at Thursday’s meeting. Posley’s first day at MPS was Monday. 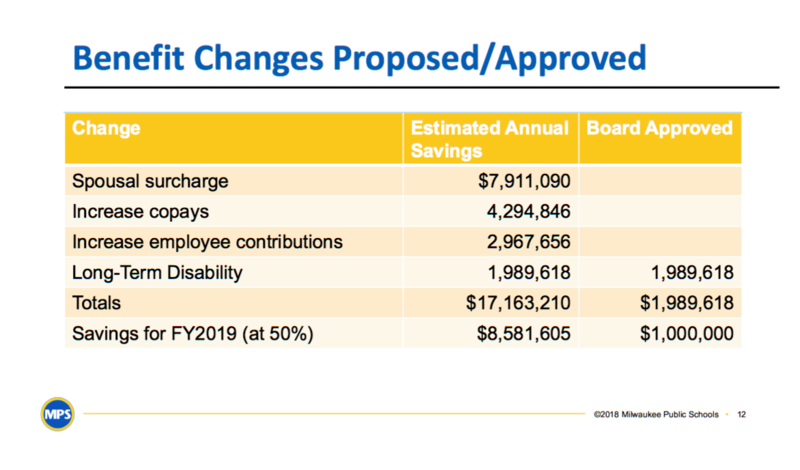 The largest amendment, proposed by board director Michael Bonds, would eliminate 2.13 percent staff raises and related wage-based benefits increases that total $9.15 million for school operations employees. The money would offset program cuts at the school level and would add approximately $140 in funding per student, almost the entire 5 percent cut currently in place. Bonds had previously suggested he would prefer taking the money for raises and keeping it in school accounts, prompting a fiery exchange between him and union leader Amy Mizialko that culminated in Bonds telling her to “go to hell.” Mizialko insisted that the budget size isn’t nearly enough for what students need, and chastised Bonds for trying to pit teachers and students against one another. Another amendment from Bonds would increase emergency room co-pays from $150 to $200. That would save the district nearly $600,000 in a calendar year, or approximately $300,000 in year one, since the changes wouldn’t go into effect immediately. The money would be immediately reinvested back into schools to reduce class sizes and support other programming. Former superintendent Dr. Darienne Driver had previously proposed raising the co-pays to $175 per visit, but the change was rejected by the school board just a few weeks ago. However, Driver’s proposal was packaged with increasing doctor visit copays to $35 and urgent care visits to $50. Depending on the type of plan they use, employees currently pay $20 copays for doctor visits and $35 for urgent care, or a percentage after the deductible is met. Packaged together, those increases would have saved the district $4.3 million. The third of Bonds’ proposed amendments would establish three furlough days – Thanksgiving, Memorial Day, and Labor Day – for all employees except essential staff. That would save the district $7.2 million, since employees would not be paid for those days. Like the other amendments, the money would go right back into school accounts to reduce class sizes. The other three amendments, proposed by school board member Annie Woodward, would also shift funds to classrooms. While none of the amendments address the issue, providing healthcare coverage for full-time substitute teachers has been a major source of tension throughout the start of MPS’ budget process. One would expand the list of Central Office departments that must cut their budgets by 15 percent. That would include the Office of the Chief of Staff, the Department of Business, Community, and Family Partnerships, the Department of Facilities and Maintenance Services, and the Office of Human Resources. The changes would total almost $2.2 million that would be redirected to schools. Another Woodward proposal would merge the Office of Innovation with another department to save $224,179. The final amendment would cut one full time position from the Black Latino Male Achievement Office, moving $143,034 back to school accounts. While none of the amendments address the issue, providing healthcare coverage for full-time substitute teachers has been a major source of tension throughout the start of MPS’ budget process. At the last public hearing, nearly every testimony either centered on or mentioned the importance of giving substitutes health insurance. One union leader, Alex Brower, is on a hunger strike until the board agrees to change the policy. The idea is likely to come up again tonight. Multiple board members have said that they’d like to reestablish the policy of providing health insurance for substitute teachers. The benefit was changed in 2012. “We don’t need MPS to hire and fly out people from California to give me a training on mindfulness,” said Elizabeth Kosmach, a fifth-year MPS teacher. Almost everyone who testified at last week’s public hearing provided examples of costs that MPS could cut in order to produce the $3.5 million it would cost to extend a 2.13 percent raise and health insurance to substitute teachers. Among those included the $10 million Office of Innovation and increased purchased services for the Department of Recreation and Community Services. Others spoke more broadly about what they see as wasteful, feel-good spending by administration. Stay tuned for more further coverage as the MacIver Institute follows this issue. Ola Lisowski is a Research Director at the MacIver Institute who focuses on education and tax policy.